Did you know that the dishwasher works harder in the drying cycle? Drying dishes is much harder than cleaning them because there are several areas in the dishwasher where water gets trapped. Since water doesn’t evaporate it can be difficult to completely dry out the inside. Also, as the dishwasher cools down, humidity becomes an issue which can result in water droplets falling onto your dishes. Some dishwashers require that you turn on the heated dry option manually. If your dishes are still wet at the end of a cycle, verify that you have activated your dishwasher’s dry option, or that the unit is not in “energy saver” mode, which may disable the drying cycle. The rinse aid helps your dishes and glasses shed water, preventing spots. If you do not already use a rinse aid, try adding it to your wash routine. If the rinse aid compartment is full even at the end of a wash cycle, the issue may be a faulty dispenser. Check the cap for damage or signs of wear. If the rinse aid dispenser cap is broken, it should be replaced. 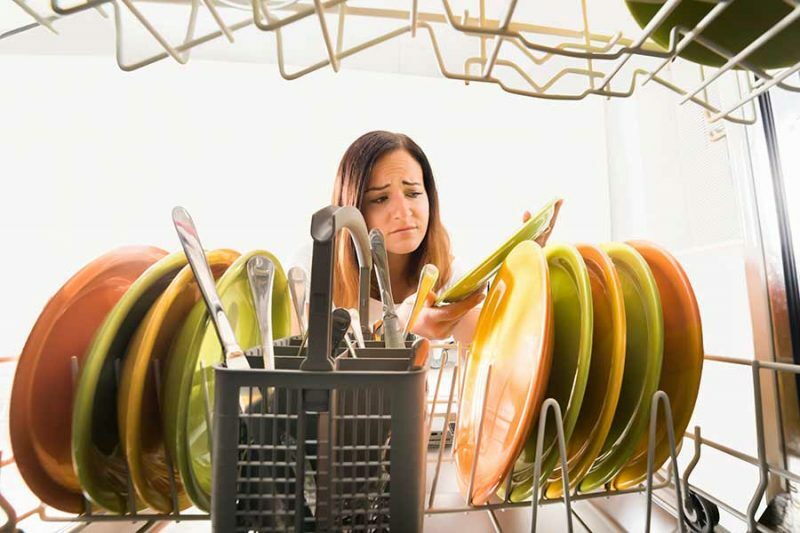 It can be tempting to load as many dishes as possible in your dishwasher to get the dishes done faster, but this may prevent the dishwasher from functioning as it should. Your dishes may not get clean, or they may not get dry during the dry cycle. Try loading fewer dishes and leave space around them. This allows more air to circulate inside so the water can evaporate more quickly. Also making sure that you load the dishes into the washer properly will ultimately help improve drying performance. It can save money to only use cold water in your dishwasher, but cold water may be why your dishes aren’t getting dry. Consider connecting the dishwasher to the hot water line. Not only does hot water clean better than cold water but it evaporates much faster. This means that your dishes will dry faster as well. The heating element heats up the dishwasher once it’s in the drying cycle. If the heating element is malfunctioning, chances are your dishes won’t come out dry. Inspect the heating element. On most models, the heating element is located beneath the tub and if you remove the bottom panel you’ll be able to see the terminals that house the heating element. Any signs of damage such as corrosion or a burnt appearance can indicate that you’ll need to replace the heater element. The high limit thermostat is a safety measure that keeps the appliance from overheating or getting too hot. A faulty thermostat will cause the dishwasher to shut the heat off before it’s had a chance to dry the wet dishes. Like the heating element, you can access the high limit thermostat by removing the lower panel behind the tub at the bottom. It will be necessary to use a multimeter to measure the continuity. All dishwashers have a drying fan. In high-end models, the drying fan circulates warm air in the interior. You may hear a slight groaning or squealing noise when you first turn it on. When the motors fail in the fan the dishes won’t dry properly. If you can see the fan, check for broken or damaged blades, or other signs of wear. If you don’t hear the fan running, it may need to be replaced, or there may be an issue with the control panel. All parts will need to be tested with a multimeter to properly diagnose the issue. The vent works in conjunction with the drying fan. When the vent opens it allows the fan to blow hot air around and helps release the moisture from the tub. When the vent can’t open due to malfunction hot air doesn’t escape and this makes it difficult for the dishes to dry. A telltale sign that you may need to replace the vent is if the dishwasher stops in the middle of a cycle. It can be a challenge identifying exactly why your dishwasher isn’t drying your dishes. There’s always the chance that the culprit could be another part within the appliance. If you’ve tried troubleshooting the issue and you’re still having the same problem it’s time to call in someone who can help. It’s Fixed Appliance Repair is a top rated repair service with skilled technicians who are capable of diagnosing and repairing the dishwasher. Contact us today to book an appointment.